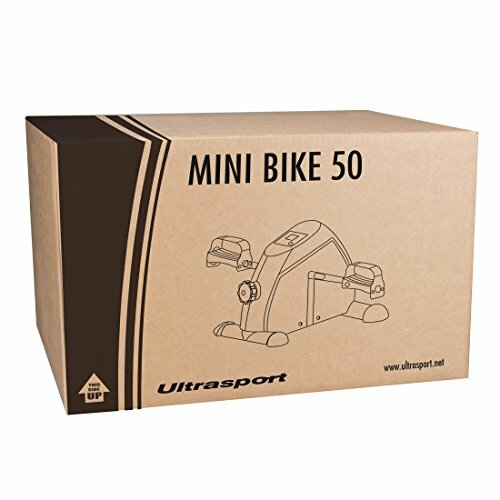 Mini Exercise Bike Do They Work ? 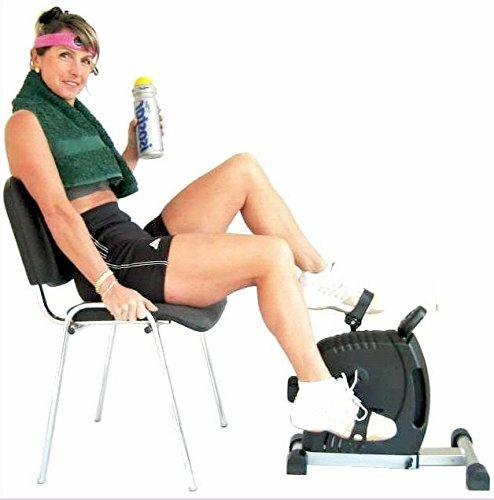 Mini exercise bikes or pedal exercisers have been around for quite some time now. 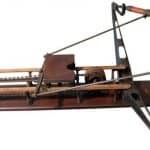 Many people still debate about the actual effectiveness of this piece of home gym equipment. 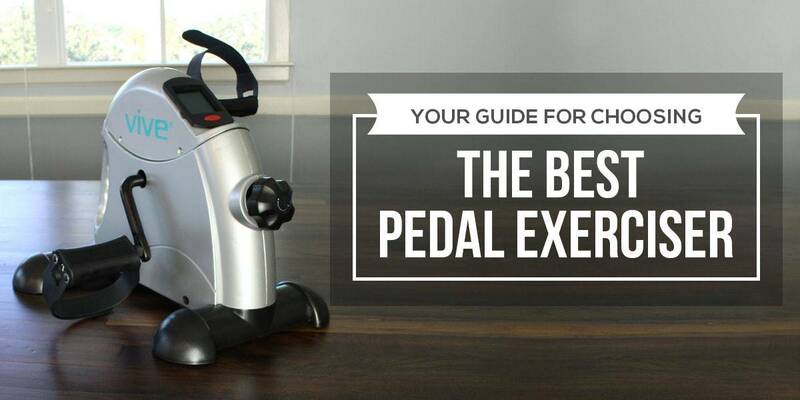 In this article we will be bringing you all the information you need to know about pedal exercisers as well as highlighting the best mini exercise bike UK-based customers can purchase. 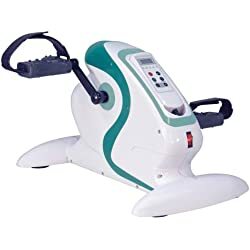 When compared to normal exercise bikes it is true that mini exercise bikes they are not as effective as a piece of exercise equipment, especially if you are looking for a demanding cardio workout. However that doesn’t mean they have no benefit as a piece of home exercise equipment. 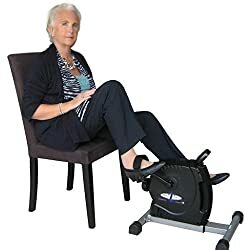 Mini exercise bikes are best suited to those looking to burn calories and lose weight as well as been extremely good for keeping the elderly active. 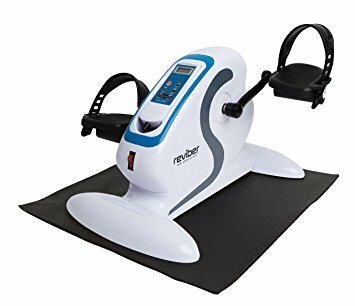 In addition pedal exercisers are perfect for those recovering from certain ailments such as knee surgery as they offer a low intensity workout that isn’t too demanding on the joints. 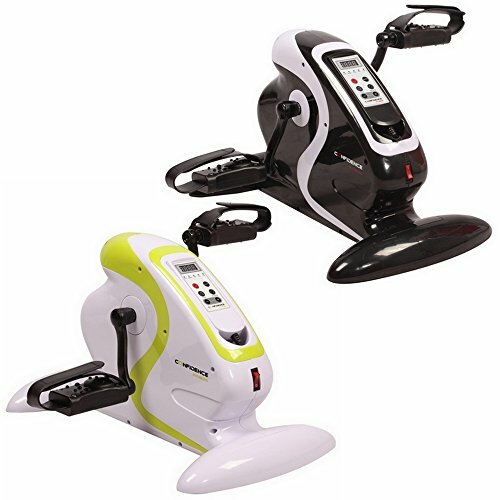 There are three different type of mini exercise bikes these are friction, magnetic and motorised. Each different type has its own use, for example motorised mini bikes are best suited for the elderly or those recovering from an operation. 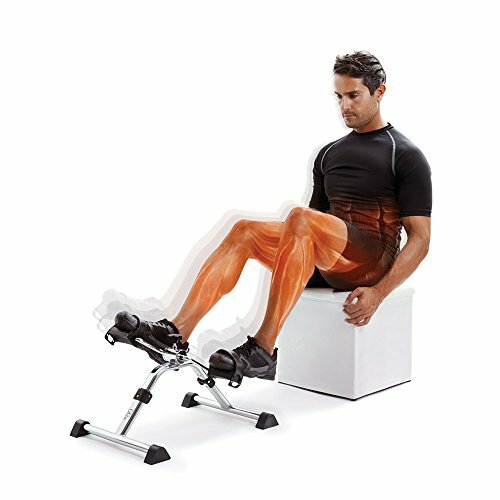 Below is more information on the three different types of pedal exercisers. Friction based pedal exercisers work in a similar way to the brakes on a normal bicycle. To apply the resistance a dial is turned and an internal clamping system applies the friction needed to cause the resistance. 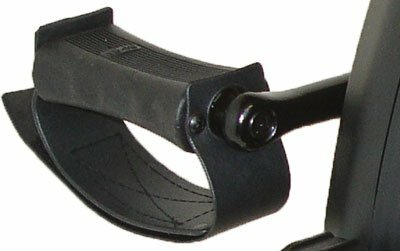 This type of pedal exerciser does tend to suffer from wear and tear due to the internal workings having to apply friction. In addition this type of mini cycle is also noisier than one that uses magnetic resistance. 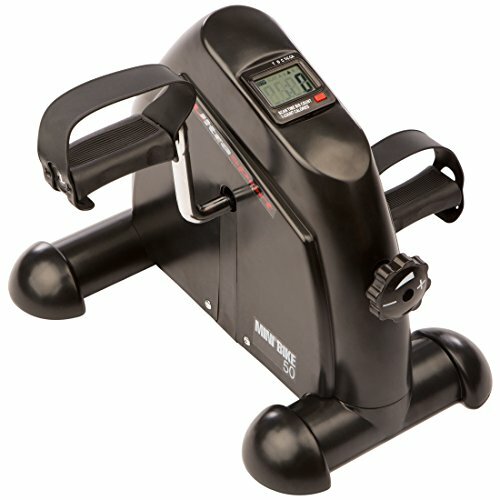 Due to the simple design they are not the sturdiest of mini exercise bikes but they are the most affordable. Mini bikes that use a friction based resistance system are more complex in their design and are constructed to a better standard. Similar to upright exercise bikes when the user turns the pedals a flywheel is in turn rotated. The flywheel is surrounded by magnets which can be set to different resistance levels to give a higher intensity workout. The benefits of magnetic resistance system is that none of the inner components come in to contact with each other. This leads to a lot less wear and tear especially when compared to the friction based pedal exerciser. These type of models last a lot longer, run smoother are a lot quieter and are far more stable due to them been considerably heavier. This type of mini cycle is the most popular with the elderly those with mobility issues and those recovering from surgery. The motorised components mean that instead of offering resistance the pedals in fact turn by themselves and aid the user. 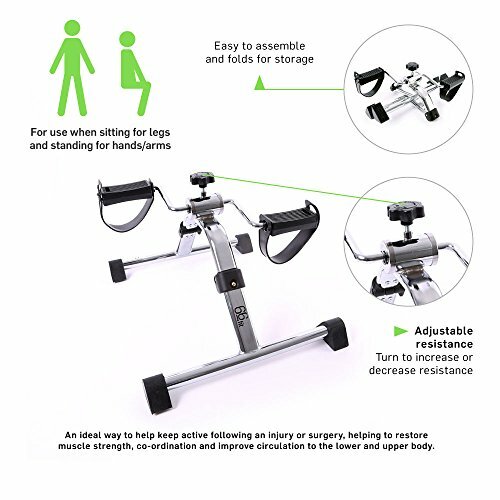 This type of exercise bike is perfect for low intensity exercise and has been proven to help improve movement in those that suffer with restricted movement. A little heavier than magnetic resistance based mini bikes but this adds to the stability. 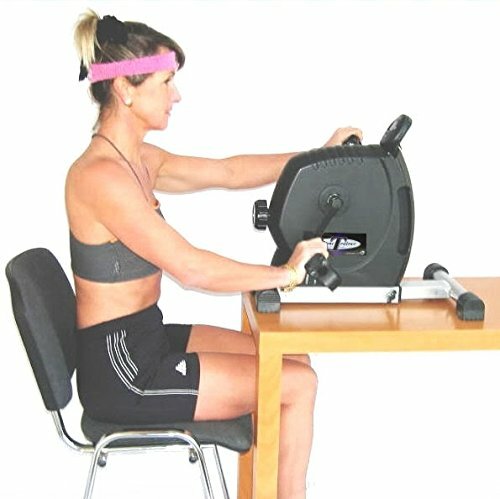 Mini exercise bikes have many beneficial attributes. Below is a list of some of the most common benefits associated with owning one. 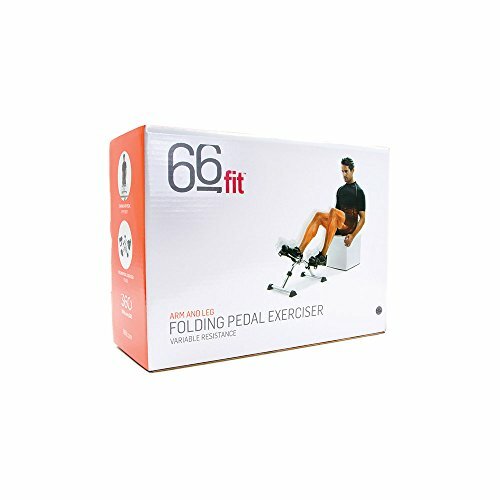 The 66fit pedal exerciser has a friction resistance and is designed with the same look as the earliest mini exercise bikes. 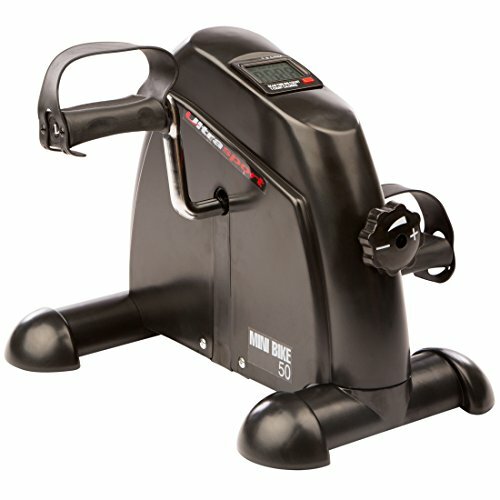 Due to this been a simple design expect it to be among the cheapest mini exercise bikes available. However this does not mean that it isn’t made to a high standard. 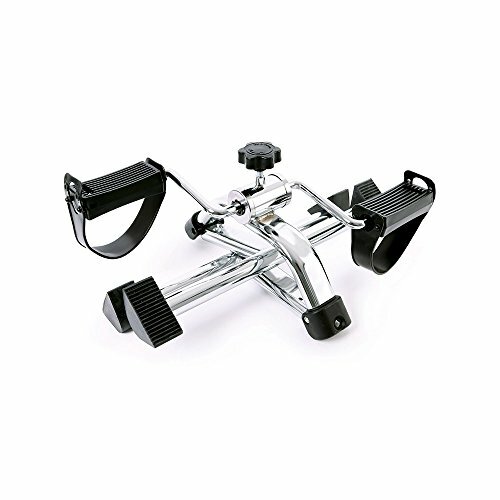 Made from tubular steel and with a chrome finish this is a very functional pedal exerciser. 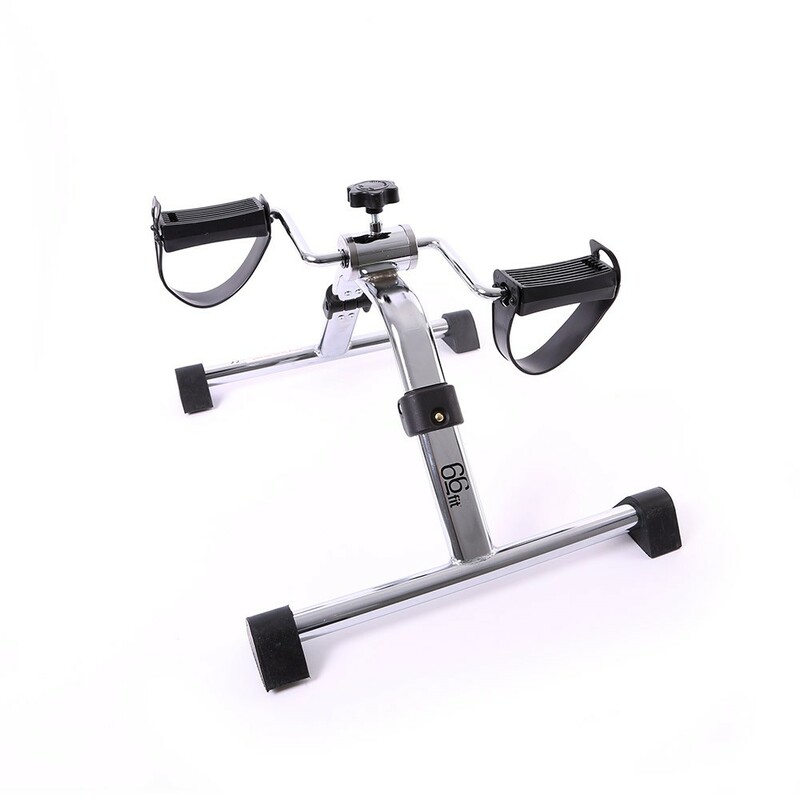 Due to it been able to be used in a sitting down position for a leg workout and on a table to exercise the arms this pedal exerciser offers a varied workout for something that takes up so little space. To adjust the resistance simply turn a dial to lower or increase the resistance level. 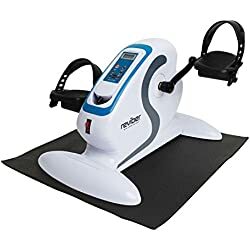 If you are looking to get a good cardio workout from a pedal exerciser this is not the one for you. 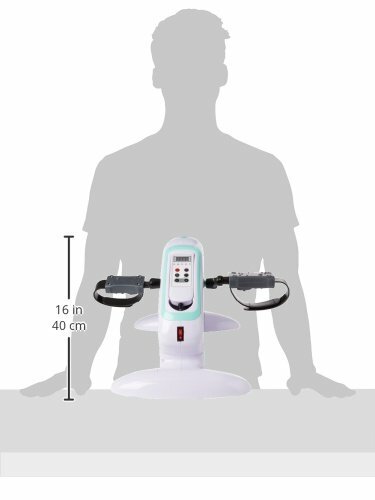 The resistance offered by a magnetic mini bike is higher and better suited to cardio. The monitor shows six functions these are time, distance, calories, scan, rotations per workout and total rotations. The resistance is again manual, with a dial to alter the resistance offered. 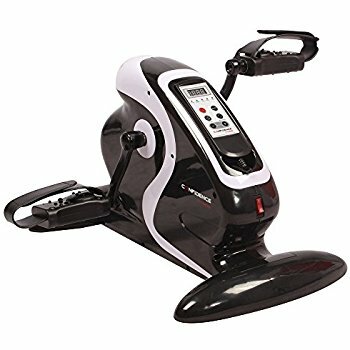 All in all a good and very affordable mini exercise bike but still not the best on the market. 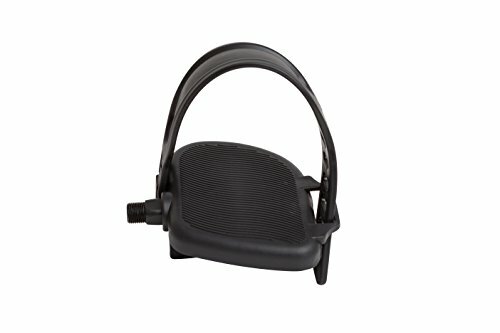 Ideal for home use while watching TV, on the phone or working. Is this the best mini exercise bike UK customers can buy? The simple answer is yes and here is why. 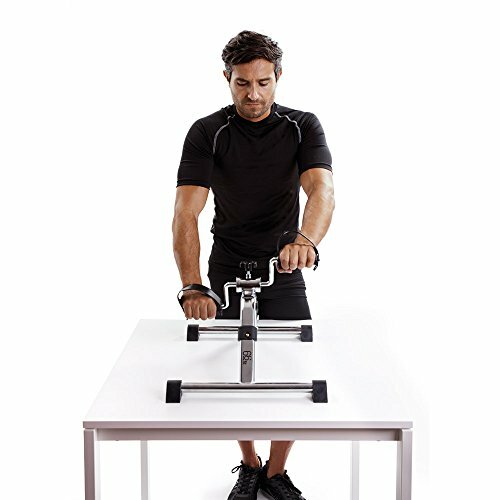 First of all this mini exercise bike uses a patented magnetic system known as the neo-system. 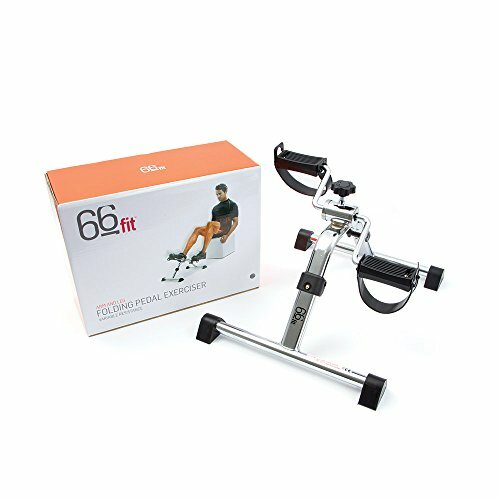 Due to the patented design there is an increase of 60% in terms of resistance offered making this a mini exercise bike that gives a good cardio workout. 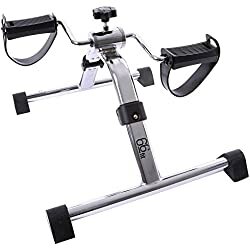 With the option to use this for both arm and leg workouts it shouldn’t be too long before the toning benefits of this exercise machine start to take effect. With a sturdy design and a wide-set base the stability of this mini bike is second to none. The magnetic resistance ensures a smooth and quiet workout making this ideal for home use. 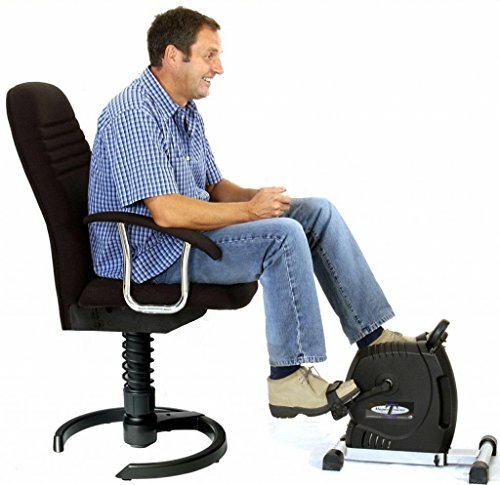 Accessories sold separately include - Ergonomic handles, extra large pedals and PC game interface. With 12 speed setting and 5 programs this is probably the best motorised mini bike for value for money. For half the price of our number one model you get pretty much all the same features. 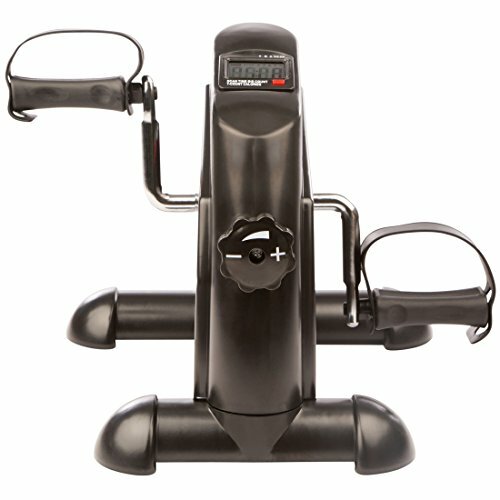 However there is no denying tat our number one mini exercise bike is constructed to a higher standard. One thing worth mentioning about this mini exercise bike is that you can switch from aided pedaling to manual. Consequently this allows the user to progress to a more testing workout if so desired. 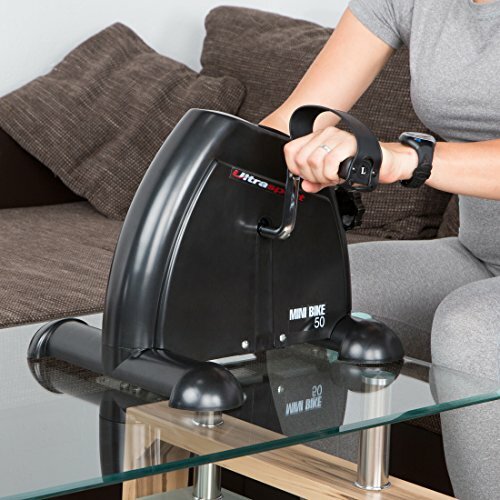 With four and a half stars this mini cycle receives nothing but positive feedback and is our best rated mini exercise bike due to its affordable price and the fact it has the same features as more expensive models. 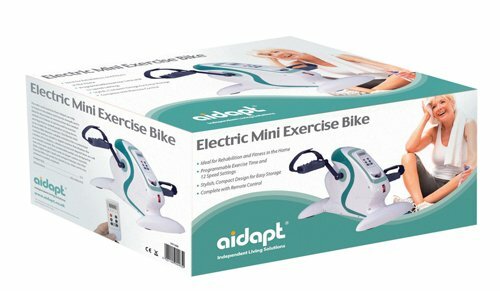 The Aidapt motorised mini bike is the bestselling motorised exercise bike on Amazon. Receiving an overall rating of four stars with over 200 positive reviews. Why do so many people like it ? This product is eligible for UK VAT relief meaning that if someone has a disability or sickness they are entitled to not pay any VAT. With this been a product aimed at those with a disability or sickness, it’s easy to see that this is one of the main reasons it has so many sales. Consequently another reason for this been the bestselling motorised mini bike is that it is very good at doing what it was built for. 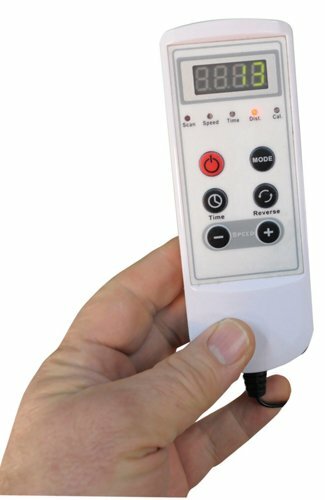 With 12 speed settings a programmable exercise time and even a remote control this is well suited to those looking for one of the best models available. 5 year parts & labour guarantee on the motor and 2 years on all other parts. Fully Assembled, just plug it in! 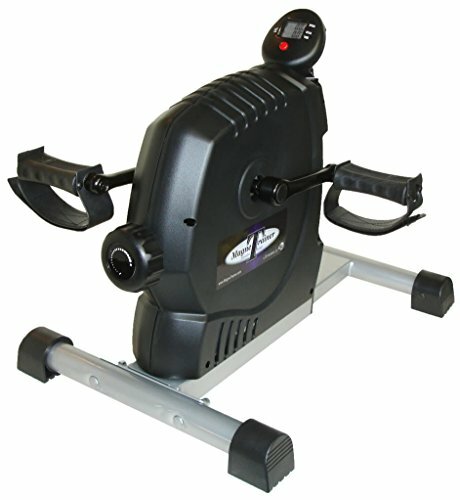 If it’s the best motorised exercise bike that is required for your exercise needs then this is probably it. 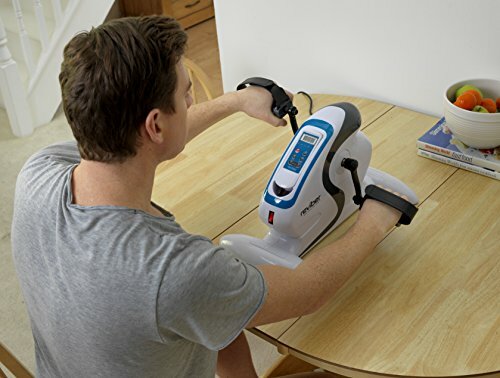 The Reviber mini motorised exercise bike is perfect for low impact exercise and rehabilitation purposes. Due to the low stress placed on the joints it is very beneficial for those who suffer with mobility issues. There are 12 speed settings and 5 programs for a varied workout. After the sequence of speed settings is completed the Reviber then goes into reverse mode. 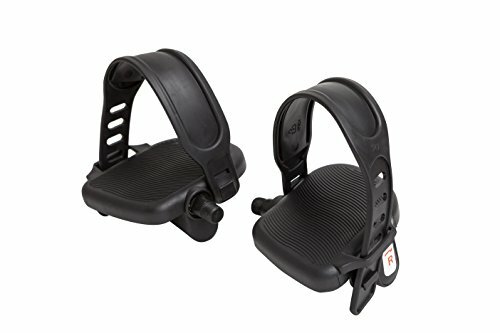 This enables the pedals to go backwards and contributes to a wider variety of muscles been used. 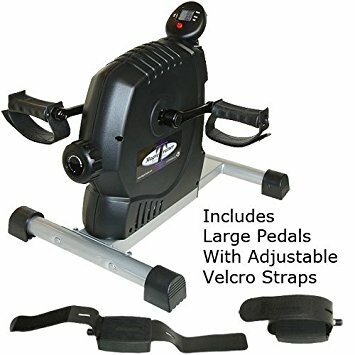 One big positive to this mini exercise bike is that it comes fully assembled and the footplates/pedals are considerably larger than most other models and the straps are notably longer. 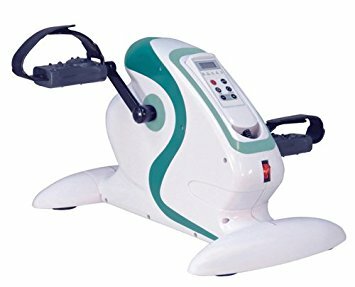 Although this is one of the most expensive motorised exercise bikes it is built to a high standard and comes with a 5 year warranty. This is NOT a manual exercise bike for cardiovascular exercise. Fully Assembled. Just plug it in! When buying a mini cycle there are a few things to bear in mind if you are to get the right one for your needs. 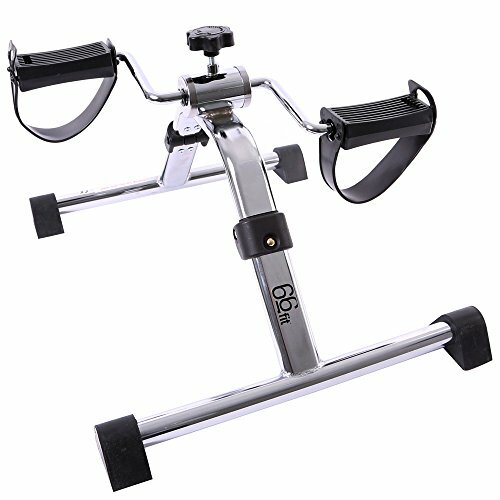 As mentioned earlier there are three type of mini exercise bike and each has its own resistance type. Deciding on the resistance type first is a good start as this pretty much sums up what the rest of the mini bike is used for exercise wise. Like most exercise machines mini exercise bikes have an on board monitor to track certain stats. 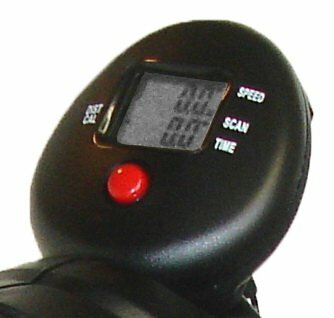 Most mini bikes have around 5 or 6 functions on the monitor are usually a combination of the following, time, speed, distance, calories burned, rotations, total rotations and scan. When buying try to purchase a model with as many functions as possible. This allows the user to track more workout statistics and consequently makes it easier to see that fitness goals have been achieved. As with any purchase it is wise to buy one with a good warranty. The good news is that many of the models featured offer a good warranty with some even been up to five years long and inclusive of parts and labour. 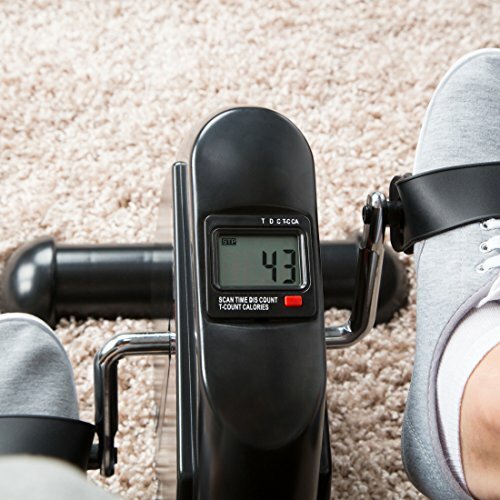 The best mini exercise bike is one that is best suited for your needs. 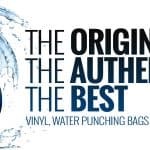 Getting this important factor correct will help considerably when deciding upon which one to buy. In this article we have brought you all the top rated mini exercise bikes and tried to give as much information as possible to aid in any purchasing decision.